Confirmation of ID in the case of Iowa cousins Elizabeth Collins and Lyric Cook. Sadly we have learned today what many had already known. According to the police, autopsies have confirmed that the two bodies found last week by hunters in the Seven Bridges Wildlife Area were that of missing Elizabeth Collins and Lyric Cook. Police Chief Kent Smock says he received confirmation Monday from the Iowa State Medical Examiner’s Office that the bodies were the two cousins, who had been missing since July 13. The full autopsy has yet to be released. Police in Iowa say an autopsy has confirmed that two bodies found last week in a wildlife area are those of two young cousins who have been missing since last summer. Evansdale Police Chief Kent Smock says he received confirmation Monday from the Iowa State Medical Examiner’s Office that the bodies were Elizabeth Collins and Lyric Cook, who had been missing since July 13. The full autopsy hasn’t been released to police. 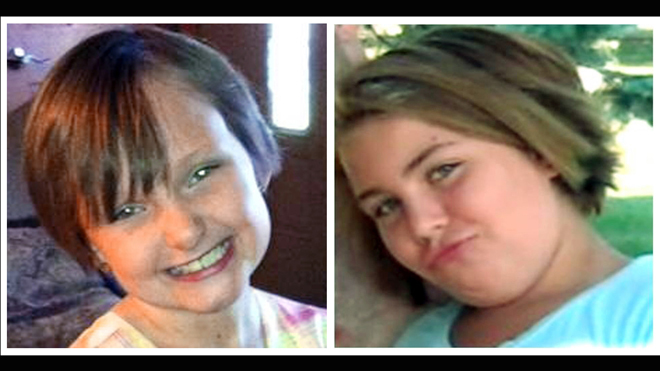 There is sad news in the case of missing 11 year old Lyric Cook and her 9 year old cousin Elizabeth Collins. On Wednesday, hunters discovered the bodies of two individuals in a wooded area that are believed to be Lyric Cook and Elizabeth Collins. The location of where the bodies were found was not revealed and there has yet to be a positive ID. However, what are the chances that two bodies are found and two girls are missing from the area? Lyric Cook and Elizabeth Collins disappeared five months ago on July 13, 2012 when they were last seen going off for a bike ride. The remains have been sent to the state medical examiner’s office in Ankeny, Iowa for positive identification. According to reports there is supposed to be a news conference on Thursday with additional information set for 4 pm. Lyric Cook and Elizabeth Collins were last seen by their grandmother on July 13, 2012 when they left for a bike ride. The two girls’ bicycles and a purse were found near Meyers Lake. The subsequent searches revealed no more clues. On Wednesday night, about 70 people attended a prayer vigil at the lake for Lyric Cook and Elizabeth Collins. Some in attendance were holding out hope that the bodies weren’t those of the missing cousins, though others seemed resigned to accept tragic news. What a sad, senseless and tragic situation. Two precious young girls taken far too soon. The community had prayed for closure and that the two missing girls would be found safe and returned home. This is hardly the closure they had hoped for. Barb Collins, a machinist who grew up in Evansdale and helped lead the group in prayer, said the community was grieving. For more updates, read others opinions and to provide your own, go to Scared Monkeys Missing Persons forum: Lyric Cook and Elizabeth Collins. 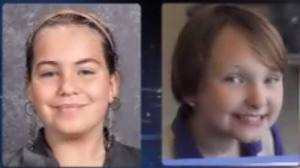 Ten year old Lyric Cook and 9 year old Elizabeth Collins have been missing since July 13, 2012 when they were last seen riding their bikes in Evansdale, Iowa. This Sunday at the Pennsylvania 400 at Pocono Raceway NASCAR is coming to the aid of the two missing Iowa girls. NASCAR Sprint Cup drivers Landon Cassill and Travis Kvapil of the BK racing team will feature photos of the missing Iowa girls at the Pennsylvania Pocono 400 on their race cars, including the phone number for the National Missing Children hotline. Kvapil hopes the effort will put a national spotlight on the investigation. Elizabeth Collins and Lyric Cook have been missing since Friday, July 13, 2012. The latest news is that the two cousins, Elizabeth Collins and Lyric Cook, were spotted on a surveillance video on the day the girls went missing. The video camera captured the two girls on tape at 12:11 pm as they rode by the camera less than a block away from their home and riding away from Meyers Lake. Authorities say that the video matches the police time line and needs to be further analyzed. The video also matches the police timeline. Investigators say the girls left the home to ride their bikes shortly after noon July 13. The camera’s clock shows it was 12:11 p.m. when they rode by. Authorities have recently stated that the girls had been abducted and believed that Elizabeth Collins and Lyric Cook were still alive. For more updates, comments and others opinions, go to Scared Monkeys Missing Persons Forum: Elizabeth Collins – Lyric Cook. 10 year old Lyric Cook-Morrissey and 8 year old Elizabeth Collins have been missing since Friday, July 13. Their bikes, a purse and cell phones were found on a path near Meyers Lake in Evansdale, Iowa; however, the have not been sen or heard from since their disappearance. FBI investigators said on Saturday that they had evidence that leads them to believe that the two cousins were still alive. FBI spokeswoman Sandy Breault said that authorities believe that Lyric Cook-Morrissey and Elizabeth Collins have not been killed, although they did not provide any information that lead them to believe this. The FBI said that they they would be expanding their search beyond Iowa. Investigators said Saturday they have evidence that leads them to believe two cousins who vanished last week are still alive. FBI spokeswoman Sandy Breault said that authorities strongly believe 10-year-old Lyric Cook-Morrissey and 8-year-old Elizabeth Collins have not been killed. She refused to say what led authorities to that conclusion, but told reporters that investigators are expanding their search beyond Iowa. The announcement came a day after authorities said they believe the girls were abducted. Authorities stated that they have not received total cooperation from all family and close friends. Lyric’s parents, Misty and Dan Morrissey, have hired an attorney, are taking legal advice, and will no longer allow police to interrogate them. Is it possible that the couples past drug involvement had something to do with the girl’s disappearance? Law enforcement officials who have spent the past nine days searching for a pair of missing cousins in Iowa say some family members are not being completely cooperative and are now under close scrutiny. “Law enforcement has not received total cooperation from all family and close friends. We feel there’s someone out there that has pertinent information about the girls’ whereabouts,” FBI spokeswoman Sandy Breault said.